With the increasing cases of dengue fever here in the Philippines these days, it is just right to inform the public on what they should know about this viral disease. Dengue fever, otherwise known as “breakbone disease,” is an infectious disease caused by dengue virus. It is transmitted through several species of mosquitoes principal of which is the Aedis Aegypti. 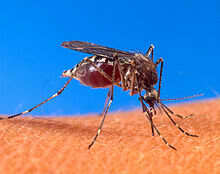 This type of mosquito can be distinguished by white markings on its legs. Trivia: Only female mosquitoes bite in order to mature her eggs! They usually bite during dusk and dawn but may still bite at any time of the day. They breed in areas where there is clean stagnant water. Sudden onset of fever is the most common presenting sign of Dengue Fever. However, about 80% of people infected with the virus are asymptomatic. Accompanying symptoms are headache (usually behind the eyes), muscle and joint pains (which is the reason behind the other name, breakbone disease) and a rash. The course of this infection is divided into three phases: febrile, critical and recovery. Febrile Phase involves high fever that lasts for two to seven days. It is also the stage where a rash may occur. We may do a tourniquet test as a diagnostic procedure to determine if the patient really has dengue or not. It is done by first getting the blood pressure of the patient and dividing the systolic and diastolic BP by 2. The resulting number would be your mark as to how much mmHg you would inflate the BP cuff that you would leave for 5-10minutes. If more than 10-20 petechiae appear per square inch, the test is positive. Critical phase needs the most attention. It is during this time that fluid may leak out to other parts of the body. It may cause shock and/or hemorrhage. Platelet count should be monitored at this time. Recovery phase lasts two to three days. Fluids go back to normal stream and the improvement is often striking. There is no treatment for this disease as of now. Main focus is prevention of complications. Fluids play a big role in early recovery. Blood transfusion is also done for severe cases. Get rid of bottles, cans and other containers that could be used by mosquitoes to breed. Change the water in your flower vases once a week. Cover drums and other water containers. If you have a fever for two days already and rashes start to appear on your skin, immediately seek medical advice. Fogging should only be done when there’s Dengue Outbreak. This is really helpful. I hope the vaccine comes out soon. Should you hear news about the vaccine, please do share with us too. Thanks! Dengue Fever is really scary is its important to maintain a clean surrounding. Our country gets so many dengue cases every year. I hope the testing done on the dengue vaccine is successful. I've experienced this before.. it was a nightmare for me and my family.. This was a helpful post! :) I hope that the vaccine would be out soon so that we can be worry-free when it comes to Dengue. Informative and really helpful! Let's all be safe guys! I am still praying that dengue won't hit my family. It's scary. Thanks for this very informative post. Always clean your gutters!